Card Text Valdr deals +2 while attacking an enemy creature on the flank. 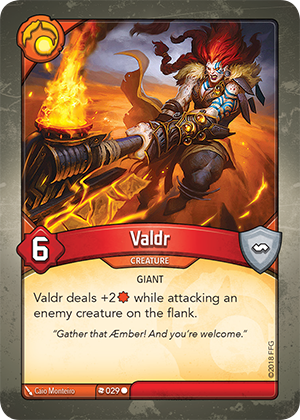 Does Valdr deal 2 damage to a flank creature with the Elusive keyword? No. Valdr’s ability just modifies the amount of damage it deals while attacking a creature on the flank, so attacking a creature with the Elusive keyword for the first time will still result in no damage being dealt.